Home > Uncategorized > Does this Plant Come with an Instruction Manual? Just like any newly purchased piece of merchandise, a plant comes with its very own use and care manual: the plant tag. It can be a valuable piece to build your garden practice repertoire and assure success for your hard work. Every plant sold, just like the clothing you buy everyday, has this use and care label. So if the plant you find in the nursery does not have this tag, I strongly recommend you do not purchase! A plant tag will provide you with the common attributes that will help you match that plant to the site where you want it to grow. 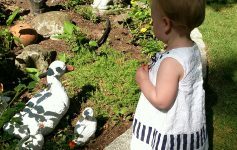 These are important factors in the initial design of your garden space. It will tell you the flower or shrub light requirements: sun, part shade or shade? 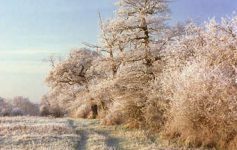 What is the plants hardiness: the temperature range it will survive year after year. (for our region select plants hardy from zone 4b/5a…refer to my last blog on plant zones) The mature height and width of the plant as well as the recommended spacing between plants is listed. You will want to know what season to expect this plant to bloom. The tag will give you this, spring summer, fall, and in some cases winter interest features. 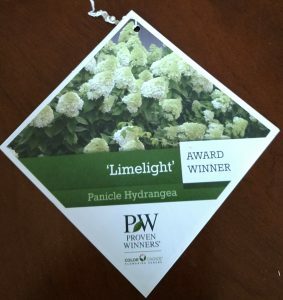 Many shrub and perennial plant tags will also give you additional information about initial planting use and care. They will list the best soil composition, fertilization timing and pruning. A valuable piece of information often found on the tags is how you can use the plant. 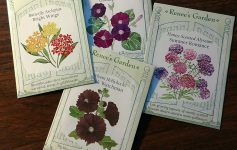 It may expand the plant information to include things like great for borders, hedges, specimen and naturalizing. This allows you to expand your options for use to the inherent plant characteristics. Many tags have great seasonal growing descriptions that read like the teaser inside the cover flap of a novel. This can give you a visual of how that plant will look in the space you have planned. Over the past few years I have noticed an expansion of plant tag information that aligns with current sustainability interest. This may include information regarding watering needs, deer and wildlife resistance and pollinator value. All these can assist the gardener in further refining their garden’s “personality”. You may also find a planting guide with diagram on the tag, commonly found with shrubs. This is especially helpful to the new gardener as it will provide a clear tutorial on basic how-tos: dig the hole, remove the plant from the pot and what needs to go into the hole before back filling. As always keeping common sense and sustainability at the forefront of all my garden designs and practices!